Perma is leading Tile Fixing Products Manufacturer company involving in manufacturing waterproof Tile Fixing materials of construction industry in India. We manufacture high quality of waterproof Tile Fixing products since 1997. We are leading Manufacturer , Exporter and Supplier Tile Fixing Products in India. Our Waterproof Tile Adhesive are easily available in India. We have wide range of Floor Tile Adhesive , waterproof Tile Fixing Adhesive , waterproof tile adhesive , Tile Fixing Compound , Tile Fixing Material,Cement Tile Adhesive , Waterproof Tile Grout , Tile Fixing Mortar & Tile Fixing Powder. Perma UTA Gold is a cementitious material in powder form composed of cement and sand, which only needs on site addition of water to make a mortar which is used for fixing tiles over any cementitious surface or on existing mosaic and tiles without removing them. 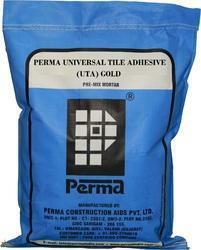 Perma UTA Gold is also used for fixing tiles on difficult surfaces also. Perma UTA Gold is mainly used for fixing glazed, ceramic, terracotta tiles and vitreous tiles, marble and granite tiles on cementitious surface or on existing mosaic or ceramic floor tiles without removing them or hacking them. Perma UTA Gold and is also used for tiling on difficult vertical cementitious surfaces and in cases where the weight of the tile is more than the normal ones. Perma VIA Gold and can also be used for plaster crack repairs and paver joint grouting. Ensure that the surface to be tiled is clean and free from dust, dirt, grease etc. Mix UTA with clean water, in the proportion of 3.5 volumes of powder to 1 volume of water. Mix till a uniform consistency smooth mortar is obtained. Leave the paste for ten minutes in the pan for the entrapped air if any to escape and remix the mortar. Apply the mortar uniformly on to the surface to be tiled as well as on the back of the tile and press the tile in position. For increasing the coverage of the material notch trowel technique can be used. While using UTA wetting of the tiles may be required in some type of tiles. Fill tile joints after 24 hours of tile laying. Coverage: One kg of Perma UTA yields a paste of 600 cc. 1 kg of UTA can fix tiles on an area of 3.22 sq ft. if tiles are fixed with a uniform bed thickness of 2 mm . Packing: Perma UTA is available in 10 kg, 25 kg, and 50 Kg multi-wall laminated sacks. Shelf Life: 12 months from the date of manufacture if stored in a cool, dry place in original packing. 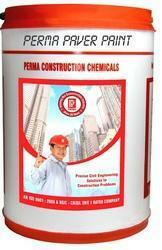 We Are Leading Manufacturer And Supplier Of Cementitious Tile Fixing Powder in India. 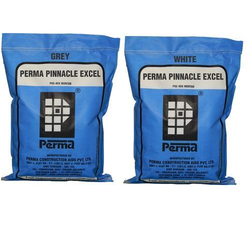 Perma NSA ECO is a cementitious material in powder form composed of Cement, Sand and Polymers which only need on site addition of water to make a mortar which is used for fixing tiles over any cementitious surface or on existing mosaic tiles without removing them. Perma NSA ECO is also used for fixing tiles on difficult surfaces. Can be used for fixing tile over tile. No need to break or hack the existing tiles. Makes the tiled area waterproof. Holds the tiles even at high temperatures. Single component hence easy to use. Withstands temperatures up to 200° C.
Perma NSA ECO is mainly used for fixing glazed, ceramic, terracotta tiles, vitreous tiles, marble, granite tiles on Cementitious surface or on existing mosaic or ceramic floor tiles without removing them or hacking them. Perma NSA ECO is also used for tiling on difficult vertical cementitious surfaces and in cases where the weight of tile is more than the normal ones. Perma NSA ECO can also be used for plaster crack repairs and paver joint grouting. Perma Pinnacle Excel is a high strength polymer based adhesive developed for superior adhesion on non-porous surfaces. The adhesive could be used with water or Latex SBR for fixing Ceramic Tiles, Marble, Stone on floor and facades. For fixing porous and non-porous tiles. For fixing tile slabs on facades. For fixing Glass Mosaic and Glass Blocks. For fixing panels made of Polystyrene, Polyurethane foams etc. All tiles surfaces should be cleaned and free of all dust and deleterious material. 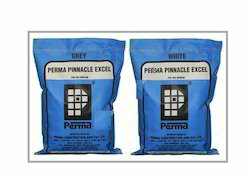 Mix Perma innacle Excel 3.5 times volume of powder to 1 volume of water with a slow speed drill machine to a homogeneous consistency. Remix the material after 10 minutes and apply the material to the surface be applied and to the back of the tile for permanent adhesion. Press the tile or slab and tap it lightly for even spread and proper bond. No wetting of tile required. Makes the tiles area waterproof if adhesive used as 100 percent bedding material. All tiles surfaces should be cleaned and free of all dust and deleterious material. Mix Tiles Cementitious Adhesive 3.5 times volume of powder to 1 volume of water with a slow speed drill machine to a homogeneous consistency. Remix the material after 10 minutes and apply the material to the surface be applied and to the back of the tile for permanent adhesion. Press the tile or slab and tap it lightly for even spread and proper bond. Perma NSA ECO is a Tile Fixing Plaster & cementitious material in powder form composed of Cement, Sand and Polymers which only need on site addition of water to make a mortar which is used for fixing tiles over any cementitious surface or on existing mosaic tiles without removing them. Perma NSA ECO is also used for fixing tiles on difficult surface also. We offer a grand variety of tile fix adhesive to our revered clients. Our manufactured products are sturdy and efficient for external fittings and internal application. These products are manufactured with the superior technology as well as optimum quality materials. These adhesives are utilized in an assortment in applications in fixing tiles, kitchen platform, and replacing broken tiles. These materials are simple to handle as well as water resistant; we offer these products as per the client specifications within a set timeline. Perma Constructions offer an extensive assortment of Block Fixing Adhesives for array of domestic, industrial and construction associated applications. These adhesives are fabricated by utilizing superior grade components to meet international quality control measures. Our range of Block Fixing Adhesives appreciated among our distinguished clientele for their optimum quality, resilience and efficiency. These products are available to our clients at market leading rates. The Block Fix Mortar is a modified polymer adhesive mortar designed for the thin bed fixing of Masonry blocks of a wide assortment, which also comprise a lightweight block. The Product, works efficiently in Block fixing with thin watertight joint, which are sturdy, and endow with effective bonding of the Masonry Blocks. These Block Fix Mortar products are widely appreciated among our revered clients. Colored Joint Mortar is a two-component thixotropic epoxy resin based colored joint mortar utilized for substantial joints among stones and tiles. Colored Joint Mortar proffers aesthetic germ resistant, rigid wearing joints; this Joint Mortar can firmly withstand the any spillage or chemical attack. Our revered range of Block Fix Adhesives is comprehensively utilized in numerous industrial, construction and domestic applications like Block Fixing. These adhesives are created by utilizing high-grade materials to adhere to international quality standards. This range of Block Fix Adhesive is widely esteemed for optimum quality, competence and durability; we offered these products to our distinguished clients at market leading prices. Renowned as a leading manufacturer and exporter, we offer an array of tile adhesive to our clients. Our product range is efficiently utilized in setting up marble tiles as well as glass mosaic tiles. . These products are widely appreciated due to the features such as water resistant, easy to install, robust. We offer an affluent range of Tile Joint Mortar is utilized for jointing as well as attaching the materials as marbles , tiles to name a few. These products are extensively utilized in commercial as well as residential applications. We fabricate these products utilizing superior quality components based on the advanced competent mechanism. These products are renowned nationally and internationally due to their features such as dependability, efficiency and reliability. The Perma Tile Mortar for fixing tiles is a polymer customized cementation material white powder, which only requires on site adding of water to make a paste. We manufacturer Cementations Fixing Tiles products are with using superior quality raw materials. They are made according to international quality standards. They can be customized as per the specifications of the clients. We have a team of experts to fabricate and check the quality of the products. We offer these products at competitive prices to our clients across the globe. wetting of tiles required before fixing. Makes the tiled area water proof. Preparation of the area: Make sure that the tiles or the stone joint operation is taken up atleast 72 hrs after the tiles are laid. The joints shall be dry and free from deleterious materials. Application: Apply masking tape where porosity in tiles or stones is encountered. If not, clean the joints with a blower and apply the grout gel using a squeeze blade. Clean the grouted area with a squeeze sponge dipped in water and finish the surface. Allow the grout to dry through air curing. 1 kg ofPerma R-POXY shall cover an area of 20 sq. ft. for joint width of 8 mm and for tile size 12” x12”. High compressive, flexural and tensile strength in excess of concrete. These Block Fix Adhesives are widely used for several industrial, domestic and construction related applications such as block fixing. These adhesives are made using high quality materials and according to the norms of the company. Our range is widely appreciated for their superior quality, efficiency and durability. These are offered to our clients at economical prices in the market. Perma Block Fix is a ready to use material which requires just addition of water on site to make a ready to use mortar. Because of thin bed block fixing one can get extra strong bonding of the blocks and helps in achieving good plumb. Perma Block Fix joints are waterproof hence there is no chance of rising dampness in the masonry. No soaking of the blocks required. No curing required. Mix Perma Block Fix powder with clean water in the proportion of four volumes of powder to one volume of water. This gives an even consistency smooth paste. Use of a mechanical or electric paddle mixer yields good results in thorough mixing. Slightly wet the blocks surface which receives the adhesive and apply the Perma Block Fix paste evenly with a suitable trowel and firmly place the building block after slightly wetting the bonding surface and set it in perfect line and level. Clear away the excess mortar immediately. One kg of Perma Block Fix yields a paste of 600 cc. One kg of Perma Block Fix can fix Blocks on an area of 3.22 sq. ft. if fixed with a uniform bed thickness of 2 mm of adhesive. Perma Block Fix is available in 25 kg and 50 kg sacks. Perma Block Fix has a shelf of 12 months if stored in Manufacturer’s original packing in a cool and dry place away from moisture and heat. Solvent Based Paver Paint is used for coating concrete floors in parking lots walkways etc. In various areas. These are available in various packaging ranges and can be customized based on the requirements of the clients. These are made using high grade raw materials and according to the international quality standards. These are accessed by our clients at nominal prices in the industry. Application: Apply masking tape where porosity in tiles or stones is encountered. If not, clean the joints with a blower and apply the grout gel using a squeeze blade. Clean the grouted area with a squeeze sponge dipped in water and finish the surface. Allow the grout to dry through air curing. Mix Part A two parts by weight to Part B one part by weight with the help of a slow speed drill equipment to a lump free homogeneous consistency. 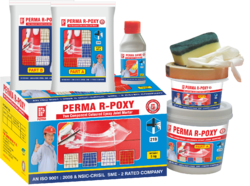 Spread the material with a spatula or squeeze float in to the joints.Perma R-POXY is designed for use in floor tile, wall tile, stone joints for interior as a jointing material and exterior application for joints width varying between 2 mm to 15 mm. The area of application are for floor and wall tiles in bathroom and shower areas, kitchen counter tops, terrace and balconies, chemical plant, hospitals, refineries, garages, laboratories, warehouses, bakeries, swimming pools etc. We bring forth an outstanding range of Glass Mosaic Adhesive in a wide range to our esteemed consumers at competitive prices. These are available with us in a variety of shades, sizes and are also available in the best possible manner and these can also be customized requirements laid down by our clients. These are contrived using superior quality material under the guidance of our expert professionals. We manufacture a quality range of Stone Adhesive which is fabricated with high grade quality raw materials. These are offered in different sizes and patterns. Our offered range of this product will most extensively used for the smooth stone surface. Our products are highly appreciated by our customers for their best quality. Our range is available at market leading prices. Ensure that the surface of the stone or slab to be fixed to the wall is clean and free from dust, dirt, grease etc. Make sure that the surface is absolutely dry. 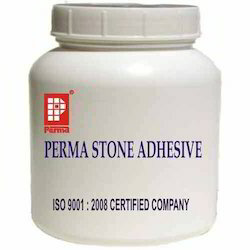 Perma Stone Adhesive is a two-component product, consisting of Base and Reactor. Pour out the base and reactor components of the product into a clean pan and mix it thoroughly with a trowel to form an even colored and homogeneous consistency slurry. Brush apply this slurry on the back of the stone. Sieve out coarse grains from dry sand and sprinkle them evenly on to the surface and allow the slurry to dry off over night. Fix the stone to the wall with Perma SA as per the normal practice giving ample support till SA achieves sufficient strength. Complicated mechanical fixing is avoided. Economical method of stone fixing. Looking for Tiles Fixing Adhesive ?